Mountain High - Top-To-Bottom Snowmaking Underway. Opening Day Is Coming Soon. Top-To-Bottom Snowmaking Underway. Opening Day Is Coming Soon. Wrightwood, CA – November 4, 2011: The regions first winter storm hit local mountains hard dropping 4 to 5 inches of new snow. 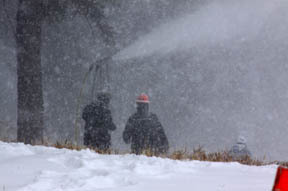 Mountain High is now making snow top-to-bottom and expects to open in the next several days. With a mixture of cold temperatures and continued snow showers, conditions look favorable for snowmaking and the Wrightwood resort plans to continue operations as long as possible. This season Mountain High invested another $300,000 in its snowmaking system retrofitting old equipment and adding new automated fan guns which turn themselves on or off depending on the weather. Not only can the resort make more snow now but the increased efficiencies reduced fuel consumption by 5% making the system “greener” and more environmentally friendly. When open, operating hours will be 8:30am to 4:00pm. Early-season tickets will be just $45 for adults and $25 for children ages 7 to 12. Kids six and under ski free when accompanied by a paying adult. Terrain will consist of predominately beginner and intermediate trails, and several small jumps & jibs will be available for freestyle skiers and snowboarders. A full line of rental and retail products will be available along with repair services and food & beverage. The Winter Sports School is not yet offering lessons but will as soon as the mountain has the necessary beginner terrain. For guests looking to save money, Mountain High’s adult, anytime season passes are still on sale for just $349 (reg $699) but they are going fast. Just 875 left. Benefits include 10% off all non-sale retail items, $10 off adult ski & snowboard lessons and the ability to track your days ridden, runs per day, and vertical feet. Children’s passes are available as well. Visit mthigh.com for more information.